In the Glorious Age of Pinterest in which we live, I’ve found that I do less and less cooking from cookbooks. There are a couple of tried and true favorites on my shelf that I refer to again and again, but mostly, if I need a recipe, I dig it up on the internet. It’s just easier, most of the time. But does that mean that I’ve thrown my old cookbooks out? No! 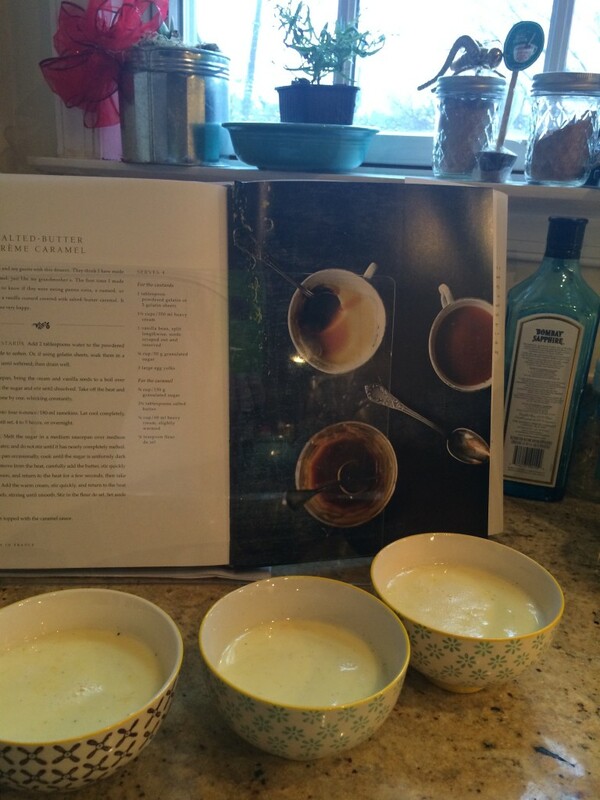 Cookbooks have taken on another function in my home: objects of beauty and inspiration. Oh, how I love paging through a well presented, gorgeously shot, visually pleasing cookbook! Even if I never cook a thing from a beautiful cookbook, it’s still nice to have on the shelf, to take down and look through if I’m feeling like I want to create something in the kitchen. Mimi Thorisson’s cookbook, A Kitchen in France, is one of those lovely books that looks good on the shelf and is pleasing to page through. It’s full of photos of the author and her family in the picturesque French countryside and the sumptuous French dishes she creates in her farmhouse kitchen. It’s a very pretty book. It would be enough for me to just look at the photos in this book and drool, but I decided to attempt a recipe and see if I could manage it. A couple of caveats, before we begin: I am eight-and-a-half months pregnant (oof) and so preparing meals that require lots of time and effort has become less of a priority as my energy levels have steadily fallen. I used to love to hole up in the kitchen and cook elaborate meals if I had extra time on my hands, but these days, I struggle against the temptation to order in take-out every night, and so must keep my home cooking simple in order to continue to eat healthfully. When I first looked through A Kitchen in France, I was drawn to the more ambitious dishes, like coq au vin and blanquette de veau. But just reading the recipe for coq au vin made me feel like I needed to take a nap, so I decided to scale down my aspirations and cook a dessert. Second, the book is organized by season, so I decided to pick something from the winter menu, just to play by the rules. 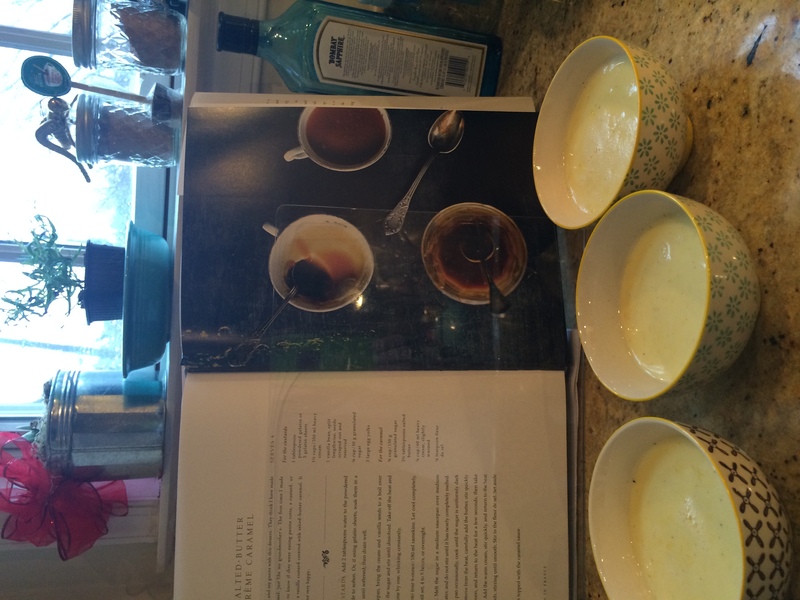 I chose to make salted-butter crème caramel. Just the name made my mouth water, plus, I’d never made a custard before so I was excited to try it. I started cooking, reading the recipe as I went along. And immediately, I encountered an issue. The first instruction in the custard-making process is to add water to powdered gelatin and set aside. I did that, and then read on. To my dismay, the rest of the recipe never mentioned the gelatin again. It was set aside, but never picked up. 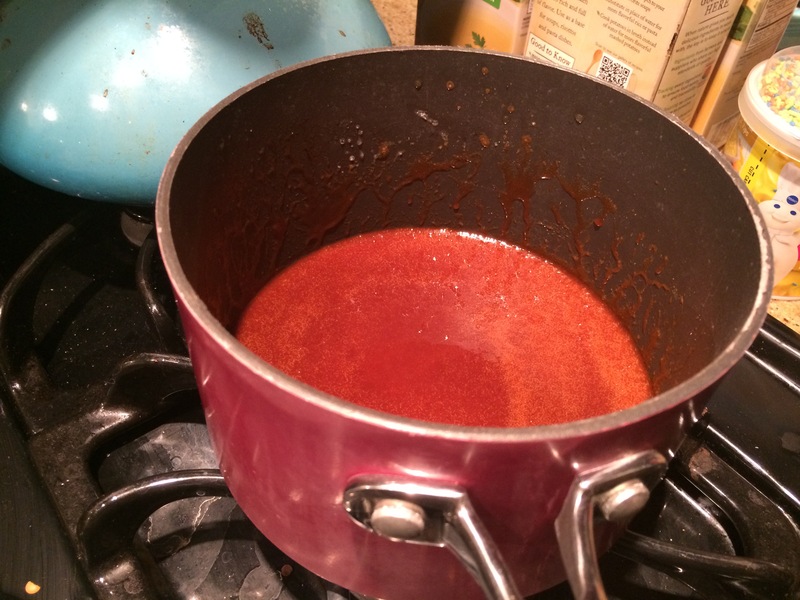 I turned to Google to try to figure out when one should add the gelatin to one’s custard (the query felt very modern-day Julia Child) but I couldn’t find a clear answer, so I just dumped the gelatin in when I added the sugar to my boiling cream and vanilla. I still don’t know if that was right. The world may never know. In the end, the custards (and the caramel) turned out well. I can’t tell if the custard was the right consistency as I’ve never made custard before and don’t typically eat it, but it sure did taste good. Al and I each scarfed a bowl after dinner and it felt very indulgent. Overall, this book is beautiful to look at and, based on the one recipe I’ve made from it, full of good-tasting food. However, I suspect it needs a good going-over by a copy editor to make sure that instructions aren’t missing from the recipes (like the gelatin confusion in the recipe I tried). The book could also do with a clear master index in the front. It’s organized into four seasons, each with their own menus, but an overall table of contents listing each recipe in the front of the book would have been helpful (although there is an index in the back). These are small complaints, however, and I am looking forward to cooking more from this book soon. 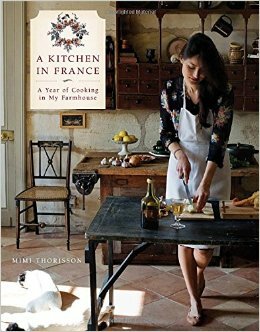 This entry was posted in Books and tagged A Kitchen in France, books, cookbook, food, Mimi Thorisson on January 19, 2015 by Stephanie.